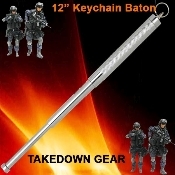 Self Defense Baton - These days trust is a word no longer familiar to daily vocabulary. Criminals are evolving younger, meaner, and more devious than ever before. Therefore, protecting the safety of your surroundings should be a priority. Constructed from stainless steel and designed to be operated by adults only for self-defense purposes. Attaches to your keychain and ejects with the snap of the wrist.